Want to whip up a simple, quick, pretty little flower that can be used for decorating just about any type of craft project? This small, flat-lying flower appliqué is perfect for a variety of different applications. It could adorn small projects such as hair clips, headbands, and gadget cozies, or you could crochet bunches of these flowers to stitch onto larger projects. You could also make a large set of these and string them together on a crochet chain to create a beautiful garland for decorating your home; a smaller version would also work as a crochet necklace. This pattern is very easy and is suitable for advanced beginners. Anyone who has learned and practiced the basic crochet stitches enough to be comfortable with using them together should find this to be a simple and quick project. And beginners who aren't quite there yet with the basic stitches will find this instant-gratification crochet project a great way to practice. Yarn or crochet thread: You can try making this project using any yarn or crochet thread. If it is your first time making this crochet flower, it is best to work with a smooth yarn in weight you're already comfortable using. The sample depicted here was made using Pale Blue Bernat Softee baby yarn. Once you get used to making the flower, you can have a lot of fun working it up in more unique yarns such as novelty yarns, plastic bag yarn or roving. Crochet hook size/finished flower size: The size of this crochet flower is going to depend upon the hook size used to make the item, which is going to depend on the yarn or thread selected in the previous step. Use whatever hook size matches your yarn, information that is typically available on your yarn label. Note: When crocheted with Bernat Softee and an F size crochet hook the flower measures approximately 2 inches. Tapestry needle for weaving in ends (optional depending on your preferred method of weaving in ends). Brackets  denote a set of instructions within the pattern that should be repeated. Ch 6. Join with a sl st to form a ring. Round 1: Work 12 sc sts in ring. Join the work to the beg of the round with a sl st. Round 2: [ch 3, work 2 dc sts in the sc st that touches the ch-3, ch 3, sl st in same sc st, sl st in next st, sl st in next st.] Rep sequence in brackets five more times for a total of six flower petals. End off. Weave in Ends. Adhere it to a blank card for a personal touch to your handwritten message. Add the crochet flower to gift wrapping or use it as part of a gift tag. Decorate a pair of old jeans with a few of these flowers along one leg (or a single flower on the pocket). Use multi-stranded crochet and a large hook to make a huge version of this flower to hang on your front door for decoration. 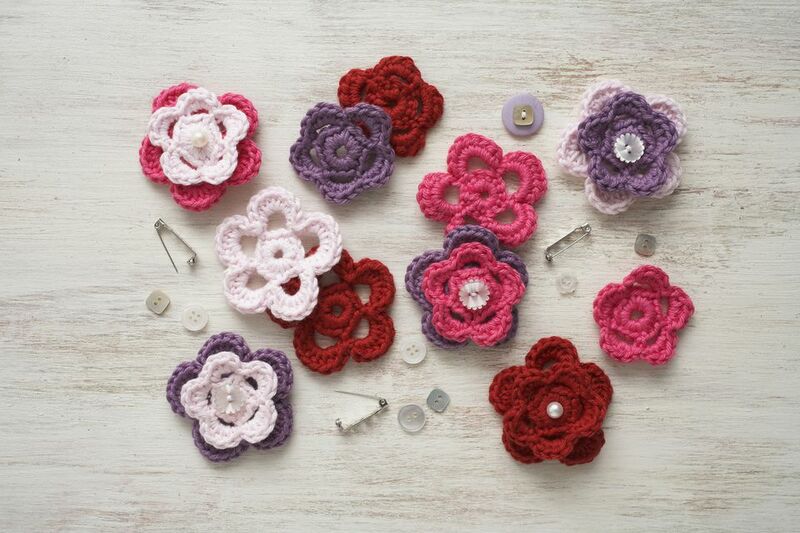 Join a row of these crochet flowers together to create a unique friendship bracelet for someone you love. Or put a single flower on each of two hooks to make earrings.